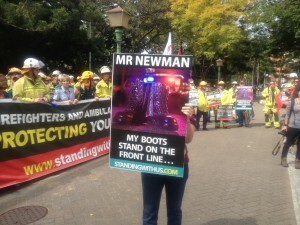 Protestors put the boot into the Newman government in Brisbane today. Boots were thrown at Parliament House during a lunchtime demonstration on Tuesday by hundreds of fire fighters and ambulance officers protesting against altered work conditions. Frontline emergency workers challenged Premier Campbell Newman to walk in their boots before his government implemented any changes. The protesters gathered at Southbank before heading to Parliament House to protest against the government’s latest work offer. State secretary of the United Fire Fighters Union John Oliver said the proposal to strip 20 certified clauses out of their agreements was not acceptable. “We don’t want to see our profession lowered to a standard where the guy from Kentucky Fried Chicken will have to come out and rescue you,” Mr Oliver said. Secretary of United Voice Gary Bullock said they were at Parliament House to make sure the politicians inside listened and did what they promised to do which was to govern for all Queenslanders. “If they (LNP) continue down this path we’ll continue to grow, we’ll continue to stand together and we’re not going to take it lying down,” Mr Bullock said. Opposition leader Annastacia Palaszczuk greeted emergency workers outside Parliament House and remained for throughout the protest. Asked to comment on the demonstration Deputy Premier Jeff Seeney said hard decisions had to be made by the Government to address the financial mess left by Labor.